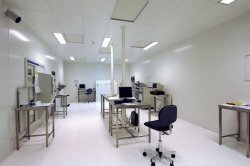 The PTA, Up-line Technological Platform, is a 1000 class clean room resulting from pooling of the technical and human resources of the INAC (ex-DRFMC) and the FMNT (Federation of Micro and Nano Technologies) grouping laboratories from the CNRS, CEA, INP and UJF (LTM, IMEP, SPINTEC, LMGP, systems activities of the G2E-lab). 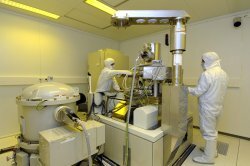 The clean room extends over 350 m² in Building 10.05 and occupies 140 m² in the BCA-INP building (in the CIME clean room, CIME standing for the InterUniversity MicroElectronics and nanotechnologies Centre). 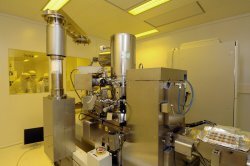 The PTA meets the specific requirements of Grenoble up-line research in terms of technological and technical facilities dedicated to nanosciences in the micro- nanotechnologies field. Its various methods and equipment facilities for lithography, deposition or etching thus enable integration of nano-objects and nano-materials or patterning of thin layers in the nanometric range. The PTA can accommodate all types of substrates from the 5 x 5 mm² sample up to the 4″ wafer as well as all types of materials. The research fields developed here are numerous: nanoelectronics, MEMS & NEMS, magnetism and spintronics, integration of nano-materials and nano-objects, photonics, … The purpose of the platform is to accompany researchers not only in the technological developments necessary for their research, but also to promote collaboration and partnerships with outside laboratories at national and international level. Flexibility and ease of access and use are the cornerstone of management of the PTA. This pooling of facilities between the major players of fundamental research in Grenoble means that an original management and administration system had to be set up for the platform run by the INAC and the FMNT. The operating overheads of the PTA are supported by the user laboratories.